Memory Frictions: Conflict-negotiation-politics. An International Conference in Zaragoza (May 6-8). Home/News/2015/Memory Frictions: Conflict-negotiation-politics. An International Conference in Zaragoza (May 6-8). 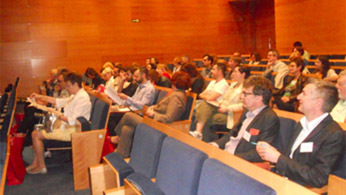 On May 6-8, 2015, an international conference on contemporary narratives in English entitled “Memory Frictions: conflict-negotiation-politics” took place in Zaragoza. More than 100 people participated in the event, which moved forward critical research in friction areas related to memory and its literary representation. 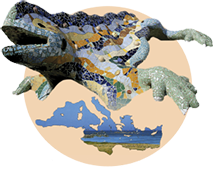 The conference, supported by the Barcelona Knowledge Hub, obtained the Academia Europaea 2015 Hubert Curien Fund. It was part of a research project funded by the Spanish Ministry of Economy and Competitiveness (FFI2012-32719), the Government of Aragón and the European Social Fund (H05). 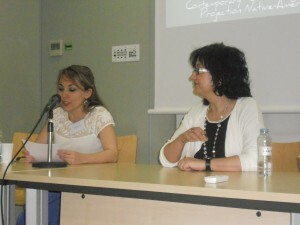 Silvia Pellicer-Ortín, lecturer at the Department of English and German Philology at the Faculty of Education (University of Zaragoza) and 2014 Burgen Scholar of the Academia Europaea and María Jesús Martínez-Alfaro were the main organisers of the event. Conference contributions focused on friction areas related to memory and their literary representation. Debates revolved around False Memory Syndrome, developments in the academic fields of Holocaust Studies and Postcolonial Studies, the spread of public historical consciousness and the evolving dynamics of reparation politics and justice.